ScoutSMART is field proven and intuitive to use. To purchase, or for further information, please contact us. As of the spring of 2013, ScoutSMART has been field proven by nearly fifty consulting agronomists in Nebraska, Kansas, and Colorado with great performance and satisfaction. To purchase or for further information please contact us. Contact us and we will promptly arrange a demo of our product via Skype. You may also opt for a 30 day free trial of ScoutSMART via our cloud services. The world is going mobile and we have developed cloud hosting of our products. Cloud hosting will make record sharing among multiple employees and / or devices simple and easy as well as providing our users with redundant data backups. Have you ever had a hard drive crash? If you haven't - one will at some time or another. With cloud hosting your data will be stored off site rather than on your local hard drive. If a computer goes down - no data will be lost. Just replace the device, access the internet, and you are up and running in no time. With the download of the free Filemaker Go app your database will also be available to you on your IOS device. To purchase or for further information please contact us. SampleSMART is our database created for the storage, finding, sorting, and analysis of all the sampling information that you collect. Storage areas are included for soil tests, water tests, tissue tests, manure tests, slurry tests, disease tests, and nematode tests. No more searching through a pile of paper, file drawers, or notebooks for the historical test information that you need to help you make the correct decision. SampleSMART is built on the powerful Filemaker Pro database that allows you to easily and quickly find, sort and analyze your sampling information. Historical test information is easily presented in a graphical format. Test results provided to you by your lab are easily imported into SampleSMART via a number of common file formats. To purchase or for further information please contact us. 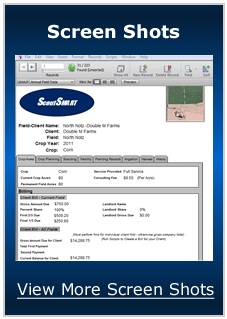 Scout Smart Crop Consulting and Data Software ©2019 | Sample Smart Data Software©2019.